Families of Formosan languages before Chinese colonization, per Blust (1999). Malayo-Polynesian (red) may lie within Eastern Formosan (purple). 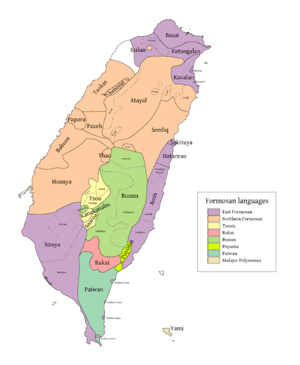 The Formosan languages are the languages of the indigenous peoples of Taiwan. Taiwanese aborigines (those recognized by the government) currently comprise about 2.3% of the island's population. However, far fewer can still speak their ancestral language, after centuries of language shift. Of the approximately 26 languages of the Taiwanese aborigines, at least ten are extinct, another four (perhaps five) are moribund, and several others are to some degree endangered. 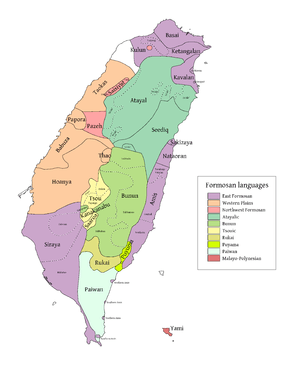 The aboriginal languages of Taiwan have significance in historical linguistics, since in all likelihood Taiwan was the place of origin of the entire Austronesian language family. 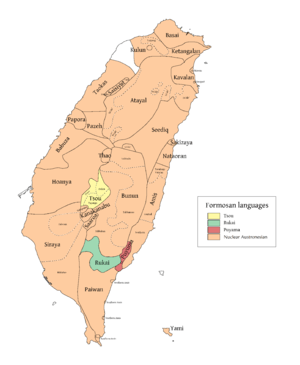 According to linguist Robert Blust, the Formosan languages form nine of the ten principal branches of the Austronesian language family, while the one remaining principal branch contains nearly 1,200 Malayo-Polynesian languages found outside of Taiwan. 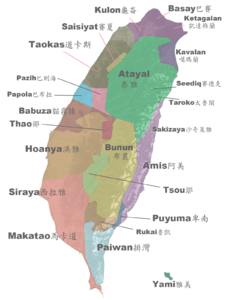 Although linguists disagree with some details of Blust's analysis, a broad consensus has coalesced around the conclusion that the Austronesian languages originated in Taiwan. This theory has been strengthened by recent studies in human population genetics, supporting also the matrilineal nature of the migration. All Formosan languages are slowly being replaced by the culturally dominant Standard Chinese. In recent decades the Republic of China government started an aboriginal reappreciation program that included the reintroduction of Formosan first language in Taiwanese schools. However, the results of this initiative have been disappointing. There are various classifications of Formosan languages. These deny that the Formosan languages form a coherent language family apart from Austronesian. It is often difficult to decide where to draw the boundary between a language and a dialect, causing some minor disagreement among scholars regarding the inventory of Formosan languages. There is even more uncertainty regarding many extinct or assimilated Formosan tribes, since our knowledge of these is often sketchy at best. Frequently cited examples of Formosan languages are given below, but the list should not be considered exhaustive. Most Formosan languages display verb-initial syntax (VSO (verb-subject-object) or VOS (verb-object-subject) with the exception of some Northern Formosan languages, such as Thao, Saisiyat, and Pazih, possibly from influence from Chinese. 1 2 Zeitoun, Elizabeth; Yu, Ching-Hua (1 July 2005). "The Formosan Language Archive: Linguistic Analysis and Language Processing". International Journal of Computational Linguistics and Chinese Language Processing. 10 (2): 167–200. ↑ Li, Paul Jen-kuei; Tsuchida, Shigeru (2006). Kavalan Dictionary (in English and Chinese). Taipei: Institute of Linguistics, Academia Sinica. ISBN 9789860069938. ↑ Blust, Robert (1999). Zeitoun, Elizabeth; Li, Jen-kuei, eds. "Subgrouping, circularity and extinction: some issues in Austronesian comparative linguistics". Selected papers from the Eighth International Conference on Austronesian Linguistics. Taipei: Academia Sinica. ISBN 9789576716324. ↑ Trejaut, Jean A; Kivisild, Toomas; Loo, Jun Hun; Lee, Chien Liang; He, Chun Lin; Hsu, Chia Jung; Li, Zheng Yuan; Lin, Marie; Penny, David (5 July 2005). "Traces of Archaic Mitochondrial Lineages Persist in Austronesian-Speaking Formosan Populations". PLoS Biology. 3 (8): e247. doi:10.1371/journal.pbio.0030247. ↑ Huteson, Greg. (2003). Sociolinguistic survey report for the Tona and Maga dialects of the Rukai Language. SIL Electronic Survey Reports 2003-012, Dallas, TX: SIL International. ↑ Li & Tsuchida (2006). ↑ Li, Paul Jen-kuei. 1998. "台灣南島語言 [The Austronesian Languages of Taiwan]." In Li, Paul Jen-kuei. 2004. Selected Papers on Formosan Languages. Taipei, Taiwan: Institute of Linguistics, Academia Sinica. ↑ Wolff, John U. 2010. Proto-Austronesian phonology with glossary. Ithaca, NY: Cornell Southeast Asia Program Publications. ↑ There are several outcomes of *g as onset or coda of the final syllable. ↑ Li, Paul Jen-kuei. 2001. "The Dispersal of the Formosan Aborigines in Taiwan." Languages and Linguistics 2.1:271-278, 2001.